Cassini Enceladus - Solar System Planets And Moons Section. Cassini Finds Active Ice on Enceladus. 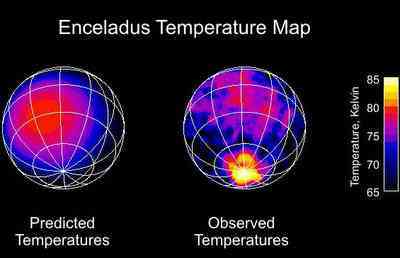 Map showing observed temperatures at Enceladus. Image credit: NASA/JPL/GSFC. Instead of being a dead, icy moon, Cassini has found that Enceladus is actually quite active. This Moon of Saturn has a huge cloud of water vapour over its southern pole, and warmer fractures. The Moon is relatively close to Saturn, so the intense tidal pressures are keeping it warmer than it should be. This is the same interaction between Jupiter and Io that keeps the Moon covered in volcanoes. Saturn's tiny icy Moon Enceladus, which ought to be cold and dead, instead displays evidence for active ice volcanism. NASA's Cassini spacecraft has found a huge cloud of water vapor over the moon's south pole, and warm fractures where evaporating ice probably supplies the vapor cloud. Cassini has also confirmed Enceladus is the major source of Saturn's largest ring, the E-ring. "Enceladus is the smallest body so far found that seems to have active volcanism," said Dr. Torrence Johnson, Cassini imaging-team member at NASA's Jet Propulsion Laboratory, Pasadena, Calif. "Enceladus' localized water vapor atmosphere is reminiscent of comets. 'Warm spots' in its icy and cracked surface are probably the result of heat from tidal energy like the volcanoes on Jupiter's Moon Io. And its geologically young surface of water ice, softened by heat from below, resembles areas on Jupiter's moons, Europa and Ganymede." Cassini flew within 175 kilometers (109 miles) of Enceladus on July 14. Data collected during that flyby confirm an extended and dynamic atmosphere. This atmosphere was first detected by the magnetometer during a distant flyby earlier this year. The ion and neutral mass spectrometer and the ultraviolet imaging spectrograph found the atmosphere contains water vapor. The mass spectrometer found the water vapor comprises about 65 percent of the atmosphere, with molecular Hydrogen at about 20 percent. The rest is mostly carbon dioxide and some combination of molecular nitrogen and carbon monoxide. The variation of water vapor density with altitude suggests the water vapor may come from a localized source comparable to a geothermal hot spot. The ultraviolet results strongly suggest a local vapor cloud. The fact that the atmosphere persists on this low-gravity world, instead of instantly escaping into space, suggests the Moon is geologically active enough to replenish the water vapor at a slow, continuous rate. "For the first time we have a major clue not only to the role of water at the icy moons themselves, but also to its role in the evolution and dynamics of the Saturn system as a whole," said Dr. Ralph L. McNutt, ion and neutral mass spectrometer-team member, Johns Hopkins University Applied physics Laboratory, Laurel, Md. Images show the south pole has an even younger and more fractured appearance than the rest of Enceladus, complete with icy boulders the size of large houses and long, bluish cracks or faults dubbed "tiger stripes." Another Cassini instrument, the composite Infrared spectrometer, shows the south pole is warmer than anticipated. Temperatures near the equator were found to reach a frigid 80 degrees Kelvin (minus 316 Fahrenheit), as expected. The poles should be even colder because the Sun shines so obliquely there. However, south polar average temperatures reached 85 Kelvin (minus 307 Fahrenheit), much warmer than expected. Small areas of the pole, concentrated near the "tiger stripe" fractures, are even warmer: well over 110 Kelvin (minus 261 Fahrenheit) in some places. "This is as astonishing as if we'd flown past Earth and found that Antarctica was warmer than the Sahara," said Dr. John Spencer, team member of the composite Infrared spectrometer, Southwest Research Institute, Boulder, Colo.
Scientists find the temperatures difficult to explain if sunlight is the only heat source. More likely, a portion of the polar region, including the "tiger stripe" fractures, is warmed by heat escaping from the interior. Evaporation of this warm ice at several locations within the region could explain the density of the water vapor cloud detected by other instruments. How a 500-kilometer (310-mile) diameter Moon can generate this much internal heat and why it is concentrated at the south pole is still a mystery. Cassini's cosmic dust analyzer detected a large increase in the number of particles near Enceladus. This observation confirms Enceladus is a source of Saturn's E-ring. scientists think micrometeoroids blast the particles off, forming a steady, icy, dust cloud around Enceladus. Other particles escape, forming the bulk of the E ring. The Cassini-Huygens mission is a cooperative project of NASA, the European Space Agency and the Italian Space Agency. The Jet Propulsion Laboratory, a division of the California Institute of Technology in Pasadena, manages the mission for NASA's Science Mission Directorate, Washington. The Cassini orbiter and its two onboard cameras were designed, developed and assembled at JPL. Additional information and graphics on these results are available at: http://www.nasa.gov/cassini and http://saturn.jpl.nasa.gov.